You can delete a single connector, by using the Delete key. If you need to delete more than a single connector in a complex diagram that contains many relations there is a special Delete Links tool which deletes the connectors only, no other drawing objects are deleted. You can select the entire diagram or any part and delete the links using this special tool, all drawn objects remain in place. This powerful procedure is done with just one click. Sample 1. Value stream map template. When you need a drawing software to create a professional looking cross-functional charts, ConceptDraw with its Arrows10 Technology - is more than enough versatility to draw any type of diagram with any degree of complexity. 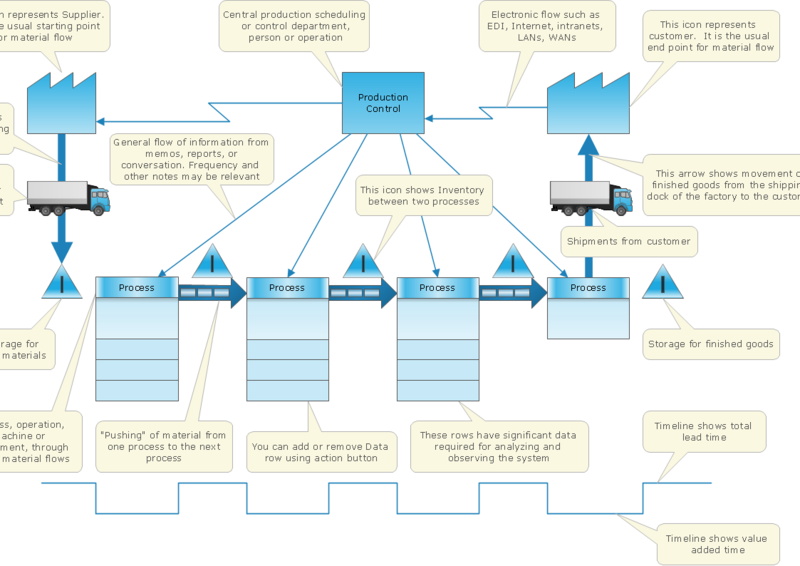 Use templates with process maps, diagrams, charts to get the drawing in minutes.